The only way I can keep my mental health in check these days are to-do lists and a game plan. I'm constantly updating my task management app, jotting down a quick list, and writing down future events on our family kitchen calendar. It's an easy way to keep stress down and productivity through the roof! 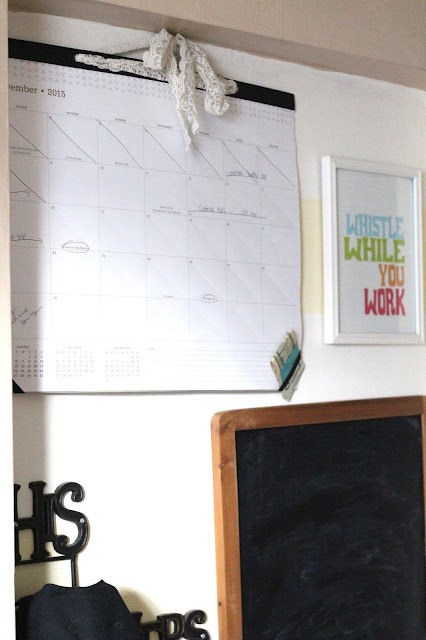 Here are a few tips on how I conquer my crazy days! Start creating (or updating) your morning routine to something that aids in your goal to be healthier and more productive. A routine helps to clear your mind and get ready to rock the day! Every time there is a trip or event, I immediately write it on the calendar that is in our kitchen so Ryan and I will walk past in every day to take a peek at it. It's a good reminder of what is coming up that day or week, and it sticks in my mind the rest of the day. Maybe it's my old age (haha) but I have to write everything down or else it escapes my memory. As soon as I think of a task I write it down in my notebook, or in a task management app in my phone (I currently use Any.Do but Ryan likes Wunderlist). I like the Any.DO app because I can move and sort tasks by "Today", "Tomorrow", "Upcoming", and "Someday". I am constantly adding and moving tasks, so I can assess what I can complete in the next couple of days and what can wait for another day or two. Be easy on yourself and be realistic! Only tackle what you can or need to that day, and save the rest for later. Nothing is more satisfying than crossing a task of my to-do list. Enjoy crossing off each task on your list! 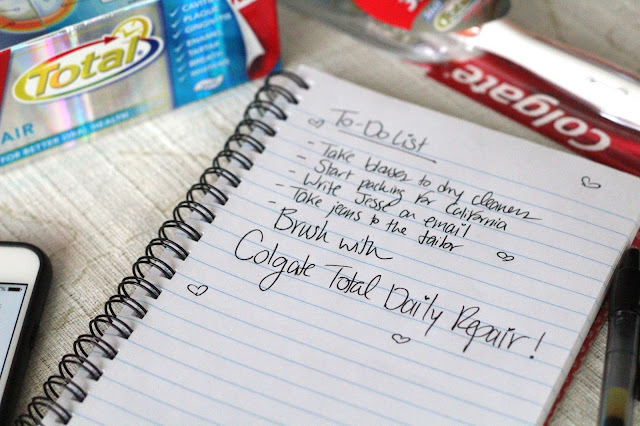 Do something today that'll make a healthy difference in your life, start with purchasing New Colgate Total® Daily Repair™ toothpaste and take care of your oral health! 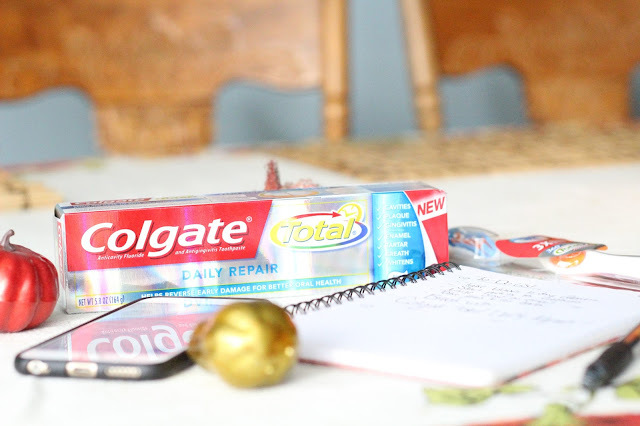 It's minty fresh, and made me confident in my dazzling smile! 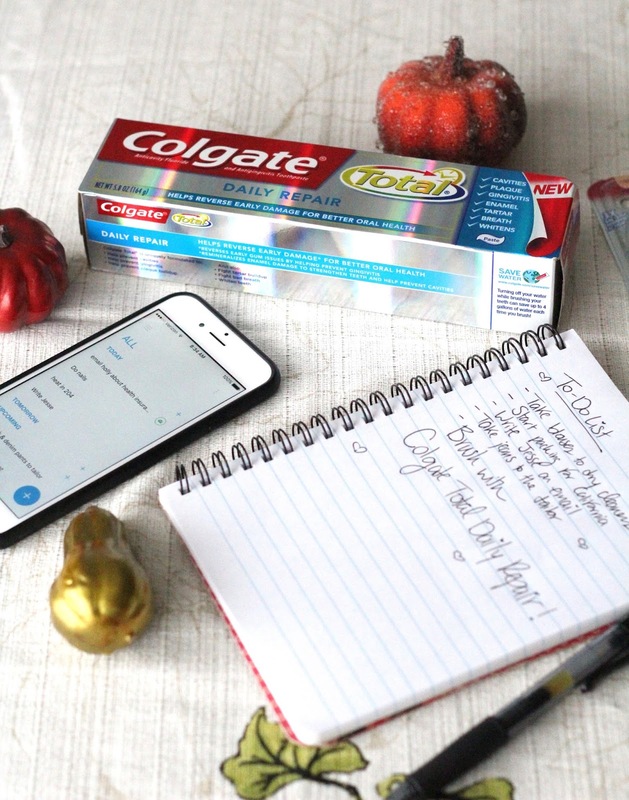 Check out some sparkling healthy smiles on Colgate's Twitter and Facebook channels! These products were provided c/o Colgate via Social Fabric. I live by my Erin Condren Life Planner! I write in little checkmark boxes with what I need to accomplish each day of the week and it keeps me organized!